■Speaking Country: Albania, Kosovo, Greece, southern Italy. ■Speaking Country: Saudi Arabia, Yemen, UAE, Oman, Kuwait, Bahrain, Qatar, Iraq, Syria, Jordan, Lebanon, Palestine, Egypt, Sudan, Libya, Tunisia, Mauritania, Algeria, Morocco. ■Speaking Country: Basque region, Spain, France. ■Speaking Country: Bangladesh, Indian West Bengal and Tripura. ■Speaking Country: Bosnia and Herzegovina, Serbia, Croatia, Montenegro, Macedonia, Slovenia, Kosovo. ■Speaking Country: Bulgaria, the Balkans, Greece, Hungary, Romania, Moldavia, Ukraine. ■Speaking Country: Cambodia, Vietnam, Thailand. ■Speaking Country: Andorra, France, Italy, Spain. ■Speaking Country: China, Singapore, Malaysia. ■Speaking Country: Taiwan, Hong Kong, Macau, Chinese in North America. ■Speaking Country: Croatia, Serbia, Montenegro, Bosnia and Herzegovina, Slovenia. ■Speaking Country: Denmark, Faroe Islands and Greenland, the German state of Schleswig Holstein. ■Speaking Country: Netherlands, Belgium, South Africa, Suriname, Caribbean Netherlands Antilles. ■Speaking Country: Cultural or Religious organization. ■Speaking Country: Estonia, Leningrad, Pskov, Omsk, Latvia. ■Speaking Country: Philippines, Malaysia Sabah, northern Indonesia, Singapore. ■Speaking Country: Finland, Sweden, Norway, Estonia. ■Speaking Country: France, Canada, Belgium, Switzerland, Monaco, French Guiana, Haiti, African countries. ■Speaking Country: Netherlands, Denmark, Germany. ■Speaking Country: The Garcia Autonomous Community of Northwestern Spain, Portugal. ■Speaking Country: Georgia(Including Abkhazia and South Ossetia), Russia, United States, Israel, Ukraine, Turkey, Iran, Azerbaijan. ■Speaking Country: Germany, Austria, Hungary, Switzerland, Poland, Liechtenstein, Luxemburg, Northeast France, North Italy, East Belgium, Botswana, Namibia, Cameroon, Togo, Benin, Garner. ■Speaking Country: Greece, Albania, Cyprus. ■Speaking Country: Northern part of Niger, south of Niger, coast of Chad, northern Cameroon, northern part of Ghana, Sardina. ■Speaking Country: India, Mauritius, Fiji, United States, Trinidad and Tobago, Guyana, Suriname. ■Speaking Country: Hungary, Romania, Slovakia, Serbia, Ukraine, Austria. ■Speaking Country: southeastern Nigeria, Equatorial Guinea. ■Speaking Country: Iceland, Canada (Myanmata). ■Speaking Country: Java of Indonesia. ■Speaking Country: Ireland, Northern Ireland. ■Speaking Country: Kazakhstan, Uzbekistan, Russia, China. ■Speaking Country: Korea, North Korea. ■Speaking Country: Iran, Iraq, Syria, Turkey. ■Speaking Country: Kyrgyzstan, China, Afghanistan, Kazakhstan, Tajikistan, Turkey, Uzbekistan, Russia. ■Speaking Country: Laos, northeastern Thailand. ■Speaking Country: Luxembourg, Belgium (Arelerland, and region of Saint-Vith), France, Germany. ■Speaking Country: Macedonia, Albania, Bulgaria, Greece, Romania, Serbia. ■Speaking Country: Indonesia, Malaysia, Singapore, Brunei, East Timor, Thailand, Cocos Islands, Autonomous Region in Muslim Mindanao. ■Speaking Country: India Clara state. ■Speaking Country: New Zealand(Maori Race). ■Speaking Country: Mongolia, China, Russia. ■Speaking Country: Nepal, Bhutan, India. ■Speaking Country: Iran, Afghanistan, Tajikistan, Uzbekistan, Iraq, Russia, Azerbaijan. ■Speaking Country: Poland, Slovakia, Czech Republic, Germany, Hungary; bordering regions of western Ukraine and western Belarus, Romania, Moldova. ■Speaking Country: Portugal, Brazil, Angola, Mozambique, Guinea-Bissau, Cape Verde, Sao Tome and Principe, Timor-Leste, Macau. ■Speaking Country: India Punjab, Pakistan Punjab Province. ■Speaking Country: Russia, Ukraine, the former Soviet Union countries. ■Speaking Country: Samoa, American Samoa. ■Speaking Country: Scotland, Cape Breton Island, Nova Scotia in Canada. ■Speaking Country: Zimbabwe, Mozambique, Botswana. ■Speaking Country: Pakistan, India, United Arab Emirates, Oman. ■Speaking Country: Slovakia, Hungary, Czech Republic, Austria, Poland, Ukraine. ■Speaking Country: Slovenia, Italy (in Friuli Venezia Giulia), Austria (in Carinthia and Styria), Croatia (in Istria), Hungary (in Vas). ■Speaking Country: Somalia, Ethiopia, Sultan, Kenya. ■Speaking Country: South Africa, Malawi, Mozambique, Swaziland. ■Speaking Country: Spain, All South American Countries(except Brazil). ■Speaking Country: Tanzania, Democratic Republic of the Congo, Kenya, Mozambique(mostly Mwani), Burundi, Rwanda, Uganda, Comoros, Mayotte and the margins of Zambia, Malawi, Madagascar, and South Sudan. ■Speaking Country: Sweden, Finland, Estonia. ■Speaking Country: Tajikistan, Afghanistan, Uzbekistan, Western Pakistan, Iran. ■Speaking Country: India Tamil Nadu, Sri Lanka. ■Speaking Country: Thailand, Laos, Burma, northwest Vietnam, northwest Cambodia, southwest China, northeastern India. ■Speaking Country: Turkey, Azerbaijan, Cyprus, Greece, Macedonia, Romania. ■Speaking Country: Vietnam, Guangxi (China). ■Speaking Country: Nigeria, Benin, Togo, Brazil, Sierra Leone, North Ghana, Cuba. About 50% of the global searches are in non-English languages. Gofair supports auto-translation into 104 languages, covering 99% of the global market. Until Feb.2019, Gofair has 21000 paid members, 7million videos. In 2018, Unique Visitors IP: 100million, PV: 600million. 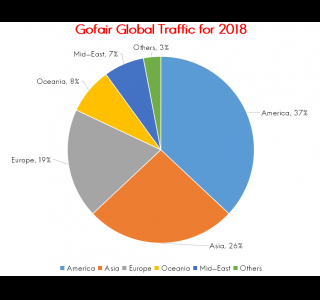 Below is Gofair's Global Traffic Distribution Chart for the year 2018.